Portable Indoor Event Arch for when you want to be seen! 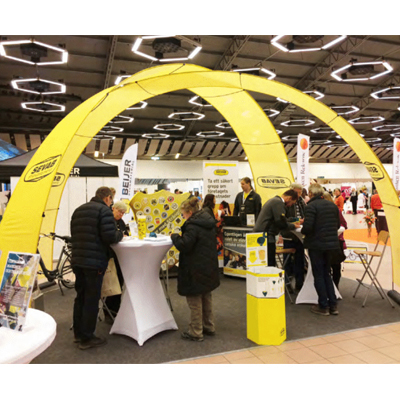 Whether you are participating at an indoor exhibition, roadshow or retail event, our Bannerbow Event Arch will inject that extra flair you are looking for. Exclusively available in New Zealand by Exhibit Group, the Bannerbow Event Arch serves as an excellent complement for your event. The unique shape of the arch creates a sense of space that invites people in. It's ideal to create a striking entrance, or an addition to your exhibition stand or retail environment. 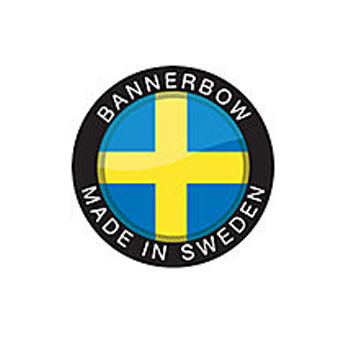 Designed and manufacutured in Sweden, the Bannerbow is a premium quality display. Flexible construction allows you to adjust the height and width by adjusting distance between the feet. Interchangable fabric graphics enables you to easily refresh and create new messages & themes. 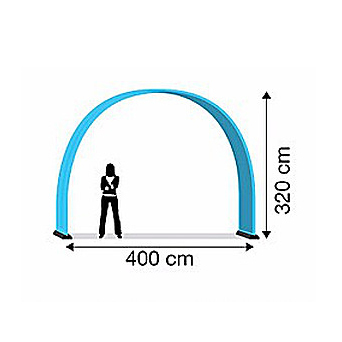 By using two event arches together, you can easily create an attractive room within a room. Hardware comprises of black powder coated steel base plates and fibre glass pole and rail sets. Stylishly designed weight plates are available for additional stability. Convenient wheeled bag comes with foam inserts which holds everything in place. 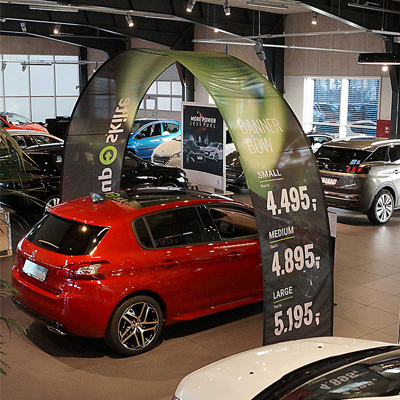 Bannerbow is internationally marketed as both an Indoor and Outdoor solution, however due to the variable and often unpredictable New Zealand weather conditions, Exhibit Group will promote this product primarily as an Indoor display solution. 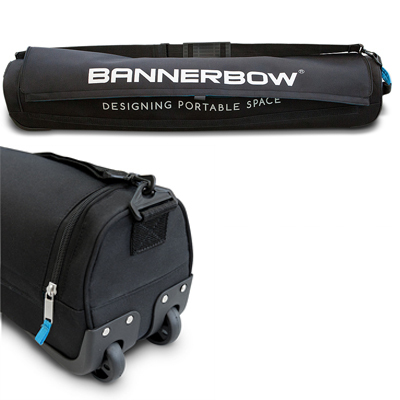 Bannerbow still has the ability to be used outdoors, however we recommend it only be used when exposed to light winds, with supervision and with the use of outdoor base plates and/or ground stakes. 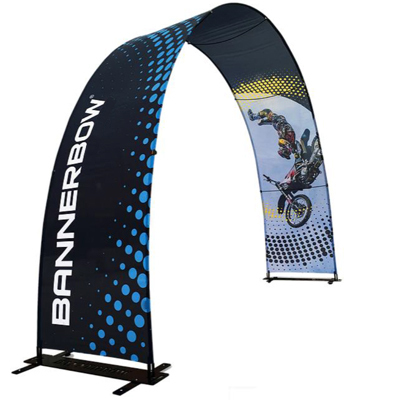 The Bannerbow Event Arch comes with a high grade singled sided flag polyester graphic panel. For logos and branding - we can help you with your graphic design or supply specification for your own designer. Ideal when extra stability is required. Weighted plates are 20kgs per pair.